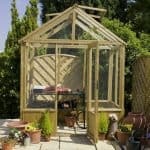 Cheap Greenhouse - Who Has The UK’s Best Cheap Greenhouse? Greenhouses don’t have to be expensive to be of benefit to a keen gardener. 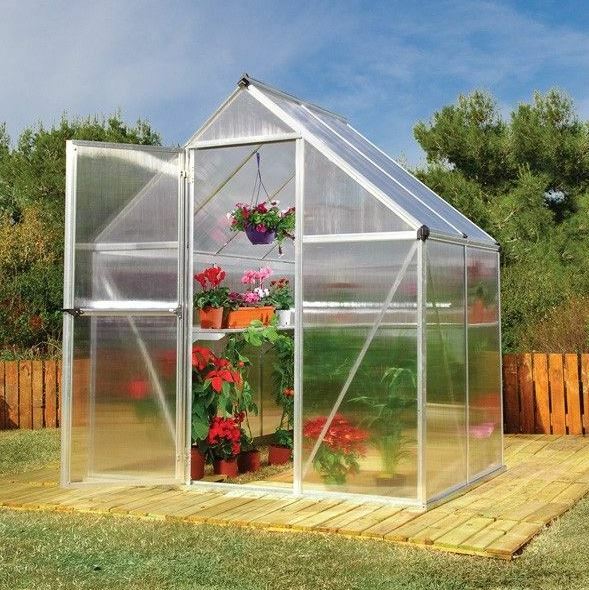 A high quality cheap greenhouse may lack some of the advanced features of more expensive models, and they typically won’t be as large, and yet they can still provide a perfect all year round environment for growing plants and seedlings. There’s also an increasing number available, which is why WhatShed have created this handy guide that can help you find the best cheap greenhouse available to buy online in the UK today. It took some research, but we’re proud to have found fifteen great products. We’ve then looked at their price and value for money, their size, durability, and of course their performance. 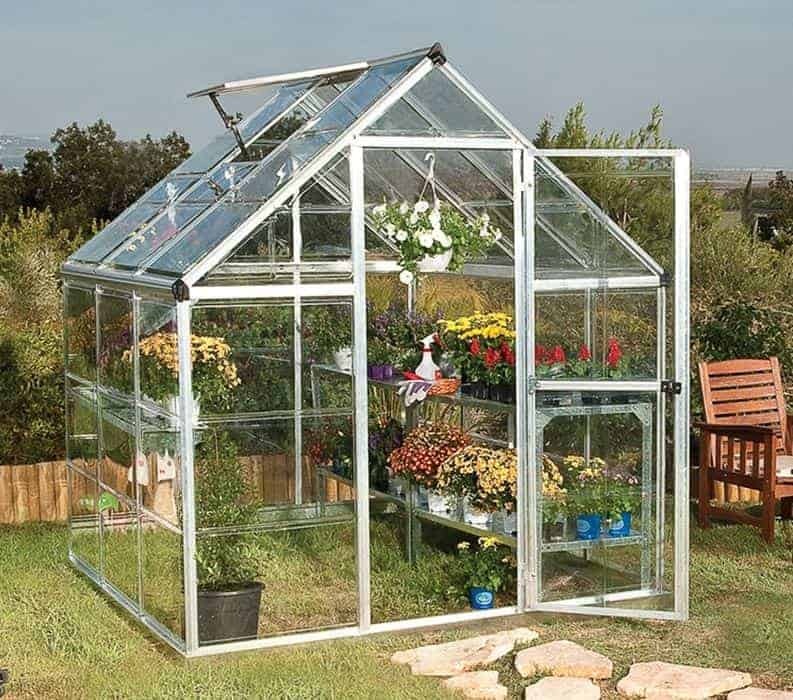 Deciding upon what exactly constitutes a cheap greenhouse is always going to be a subjective assessment, after all cheap to one person may be less so to another. We wanted a cut off point that would still include a broad section of diverse greenhouses, including some that were large enough to walk around. After studying all the greenhouses sold by the UK’s ten leading retailers we fixed upon two hundred and fifty pounds as being the ideal figure. Once we had decided upon the cut off price, we were pleased to find fifteen high quality models that all had something special to offer the consumer. In a competitive category, special congratulations go to the six foot by six foot Palram Harmony model. 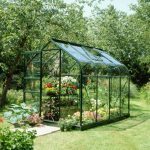 Thanks to its excellent value, extended warranty, and accommodating dimensions, it gains the accolade of being named the best cheap greenhouse that can be bought online in the UK today. Whether you’re looking for greenhouses, sheds, or playhouses, WhatShed have the independent reviews that can help you make an informed purchasing decision. You may expect a cheap greenhouse to be small and compact, or maybe to have a wall garden style rather than being a stand alone. While these qualities can be said to apply to many of the greenhouses in this list, this Palram Harmony greenhouse is surprisingly spacious. It has a base area of 1.85 x 1.85m, and a ridge height of 2.08m so there should be no difficulty in getting through the single door or walking around. This is in fact the largest greenhouse in our top fifteen list, bringing with it obvious advantages as it means that you can grow more items at any one time. It also has added value in the shape of a five year guarantee, and these two factors help it achieve its place at the very summit of our league table. 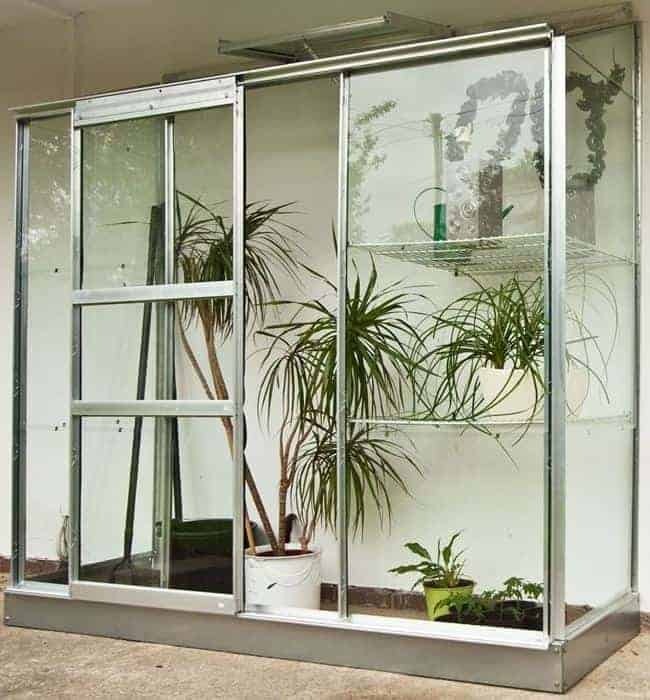 Aluminium framed cheap greenhouses such as this make up the majority of those featured in our table, and this is a perfect example of why they can make a great choice for gardeners on a budget. Despite its size it’s lightweight and easy to install, and once it’s up it requires absolutely no maintenance or treatments other than a hose down or clean from time to time. We were also pleased to find it had a strong and yet rust resistant galvanised steel base. We’ve reviewed lots of Palram greenhouses in our time, and we invariably find them to be well constructed and yet offering very good value for money. It’s little surprise therefore to find their inexpensive yet practical Harmony model taking the top two spots in our cheap greenhouse list. This is the six foot by four foot variety, and so it’s slightly less accommodating that our table topper, but it still roomier than many other inexpensive greenhouses that we review. It also has a price that’s less than two hundred pounds, and it’s this outstanding value that helps it deservedly achieve the runner up position. Once again this features a silver coloured aluminium frame, which some people may find a little too metallic in appearance, but we think that it looks stylishly contemporary. Polycarbonate panels are used, rather than horticultural or toughened glass, but this is a feature that we commonly see when we review a cheap greenhouse. One advantage that this particular model has over many of its competitors is that as well as an opening vent it has an integrated guttering system. This means that rainwater can be easily collected and then used to water the plants within the building, creating a greener way of nurturing your plants. This is the first timber framed cheap greenhouse to earn a place in our league table, and it’s sure to appeal to traditionalists, particularly those who already have wooden garden buildings such as sheds on their property. It certainly caught our eye from the moment we saw it, thanks to the pleasing contrast between the high quality timber and the polycarbonate panels. 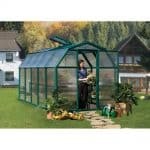 This is the most attractive compact greenhouse that we’ve reviewed, which makes its lowly price tag even more appealing. For the money there’s a surprising amount of growing space available as well, with a base width of 1.96m and a base depth of 0.92, and these dimensions are enhanced by a peak height of 1.97m. What made this cheap greenhouse from BillyOh particularly stand out for us, even when compared to other wood clad greenhouses of a similar size and yet a higher price, is that it is fully boarded around the lower section. This places even more emphasis visually on the wood, and it also helps create a more stable building, which is ideal if you’re going to be positioning this greenhouse in a windy area. It seemed to us to take inspiration from the Victorian greenhouse style, which is a real garden classic. 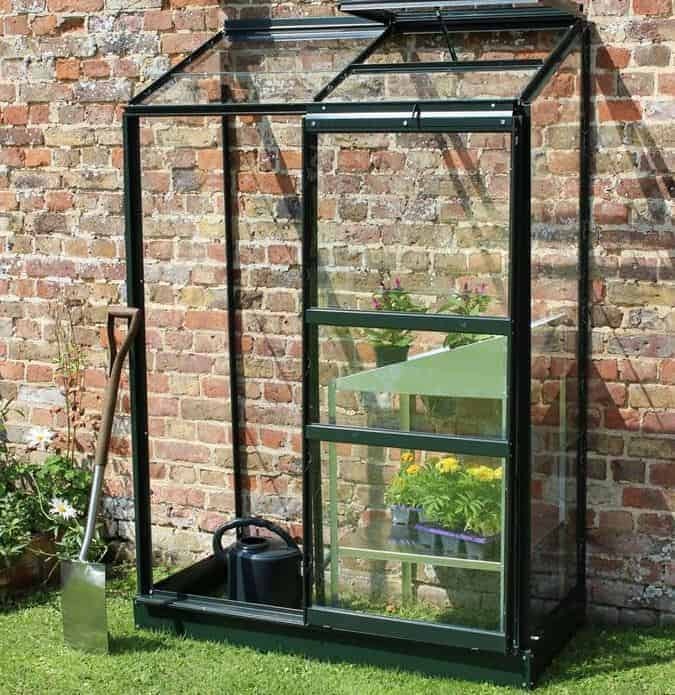 This cheap greenhouse shares some qualities with its Palram stablemate in second spot within our league table, in that it has a similar six foot by four foot base area and a weather resistant aluminium frame. Appearance wise it looks very different however, and that’s because whilst polycarbonate glazing is once again used on this occasion it has a frosted effect rather than being crystal clear. One advantage of this is that it brings added privacy, and makes it more difficult for any passers by to see if anything of value is being kept within the greenhouse. We were pleased to see that the manufacturer still claims that these polycarbonate panels provide a 70% light transmission rate, as this is commensurate with the figures we often see when reviewing a plastic glazed cheap greenhouse. The panels are also very tough and shatter resistant, making them suitable for those who are worried about the prospects of children playing near to the greenhouse itself. We also found it noticeably taller than many six foot by four foot greenhouses we’ve reviewed, and the 2.09m ridge height means not only that it should be a comfortable environment to spend time in, but that there’s lots of vertical space that can be utilised with the addition of shelving. Metal framed greenhouses can bring many advantages over more traditional wooden greenhouses, in that they’re often much quicker to assemble, won’t need painting or treating with wood preserver on a regular basis, and are immune to rot as well as to insect and rodent attack. We know that some people are deterred from buying them however because of their metallic look that many perceive as being dull and uninspiring. This could be the aluminium greenhouse to change their minds, as we found the dark green colouring of the frame to be striking and vibrant. It’s for this reason that it earns a place within our league table on its own right, although the significantly higher price tag does mean that it has to occupy a lower position than the silver framed model we looked at earlier. Nevertheless, we feel that the asking price of just under two hundred and thirty pounds does represent more than reasonable value for money for a stand alone greenhouse with a base area of approximately six foot by four foot, especially as it should be very easy to construct. 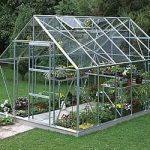 The polycarbonate panels simply slide into place along the frame and then lock into place, so it’s an ideal choice for those who feel daunted at the prospect of assembling a cheap greenhouse on their own. 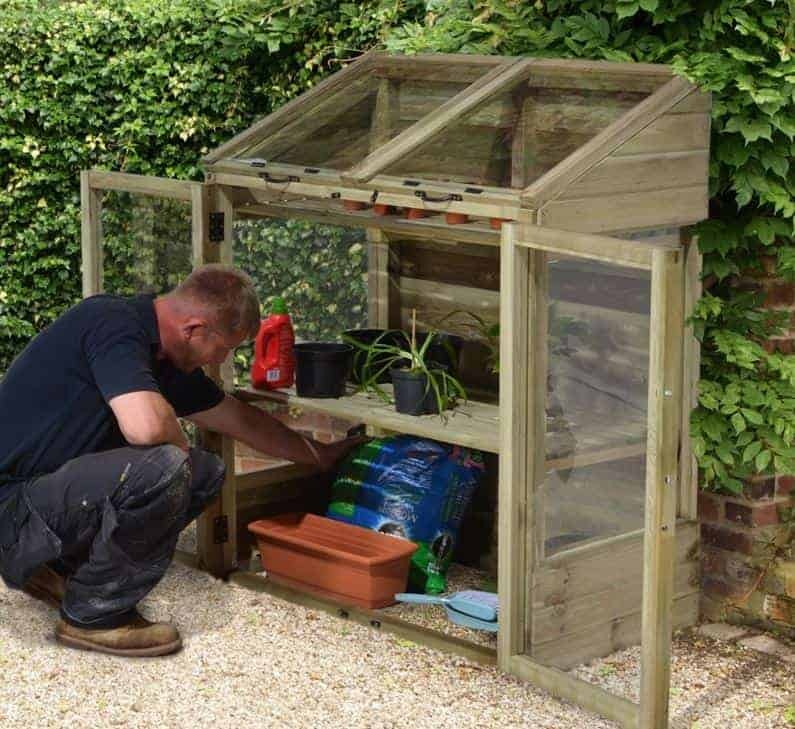 This is the first mini sized cheap greenhouse in our league table, and yet it still gains a place within the upper half by being very durable and having a very affordable price tag. The base area is a mere 1.20 x 0.62m, and the peak height is only 1.40m, but this in itself can bring with it significant advantages. We feel that this would make a great purchase for people who want to grow plants all year round, and yet have very little lawn space available, or even no space at all. Thanks to its compact footprint this could easily be positioned on a patio or decking area, or even on a balcony. Despite its size, we found a lot to like about this cheap greenhouse, including the two shelves which are supplied as standard. Being constructed from tongue and groove cladding we also found it both pleasing on the eye and are sure it will feel strong and stable. We were also glad to see that the wood had been pressure treated to give it long lasting protection against the threat of wet rot without the need for it to be treated every year by the owner. 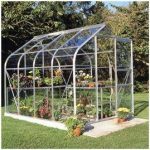 This is unique for a cheap greenhouse, and it also brings with it the reassurance of a 15 year guarantee. We now come to another cheap greenhouse with a compact footprint of approximately four foot by two foot, and yet this one looks very different to the wooden greenhouse we’ve just looked at, and to the other Palram greenhouses in our league table. That’s because it’s an aluminium framed model that has a lean to design. We were pleased to find that it comes with all the fixtures and fittings needed to attach it to a strong fence or ideally a wall, and this brings two distinct benefits: firstly the supporting structure gives added protection against rain and snow, and secondly it makes the greenhouse very stable even in windy conditions. Getting in and out of this greenhouse should be easy, thanks to the sliding door that takes up half of the frontage. One of the two polycarbonate panels that make up the pent style roof can also be opened, and then locked into place. We were glad to see this, as it means that the interior can receive adequate ventilation even on a hot day. The thing that impressed us most of all, however, was the asking price. 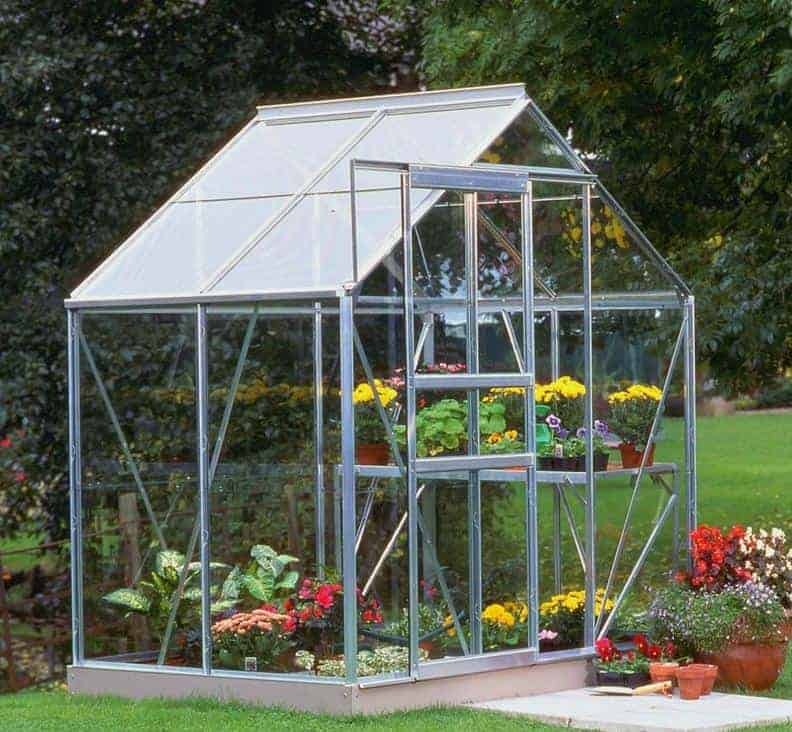 This is by far the cheapest greenhouse in our top fifteen league table, and the excellent value for money that it provides, especially as it comes with a 5 year warranty, helps it into the top half. 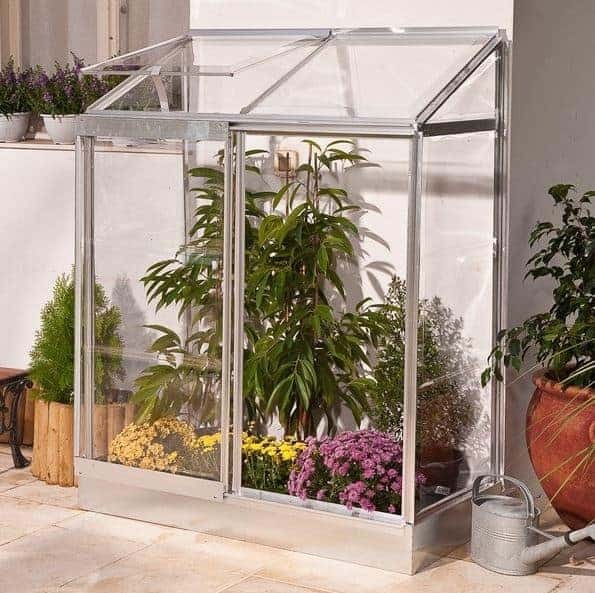 This silver framed cheap greenhouse from Halls is popular by name and popular by nature, which is unsurprising when you consider how much high quality greenhouse you get for a very affordable price. The base area of 1.92 x 1.32m is allied to a ridge height of 1.88m, so there’s more growing space than you might imagine at first sight. We were very impressed by the high quality components used throughout, which is also something we usually found on the larger and more expensive models in the Halls range that we’ve reviewed, and it’s only the lack of an extended warranty that prevents this from gaining a much higher position in our league table. One example of the unusually high quality that we found throughout this cheap greenhouse is the use of horticultural glass rather than polycarbonate glazing. This allows even more light and heat to be transmitted to the plants inside, which can bring significantly better results. It’s something that we rarely see in a greenhouse that’s as affordable as this one, and we were also pleased to see that there’s an option to upgrade the glazing to toughened glass, making it virtually shatter proof and very secure, although that does add significantly to the original asking price. 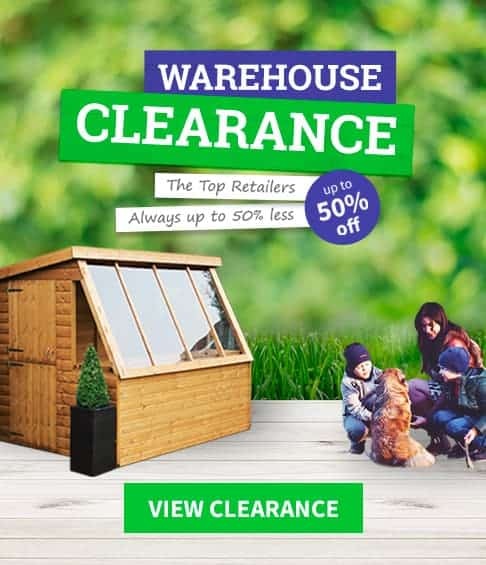 This is a cheap greenhouse that looks much more expensive than it actually is, even though it uses cost effective styrene glazing, thanks to the use of high quality shiplap cladding and the boarding across the bottom third of the structure. We found it very aesthetically pleasing, and it’s sure to be a hit with those who prefer traditional wooden garden buildings to either metal or plastic substrates. It will need to be treated annually with wood preserver to keep the threat of rot away, however, and this can bring a cost in both time and money. It’s this and a higher than average price tag that accounts for its ranking in the bottom half of our league table, although we were pleased to find that if the annual treatment schedule is adhered to then a 10 year warranty against rot comes into play. Once assembled, we were impressed by just how strong and stable this cheap greenhouse feels. That’s because it boasts a 44 x 27mm frame, which is substantially thicker than we often see. It was also a little taller than most four foot by six foot greenhouses that we review, with a ridge height of 2.10m. This meant that you shouldn’t have to bend down when walking around, but it can also mean that you can fit more plants inside. This is another very compact cheap greenhouse, this particular model having a base area of 1.20 x 0.63, but the comparatively tall height of 1.44m still means that you can fit a reasonable amount of plants and seedlings inside. This is helped by the two shelves, which we were pleased to find were included as standard. Another feature that we really liked was the two lifting lids that make up the roof. They can both be opened and locked into place at a variety of height settings, so that they can be adjusted to suit both the weather conditions and the size of the plants growing within. Once again we found the combination of high quality planed timber and polycarbonate glazing used in this cheap greenhouse to be pleasing on the eye, and we were glad to see that hardwood has been used rather than the softwoods such as spruce and pine that we more usually see. Hardwoods are often naturally resistant to rot due to oils within their fibres, and they can be very tough and durable too. We were also pleased to find that they are FSC certified to show that the wood comes from a sustainable source, making this greenhouse suitable for the most environmentally aware gardeners. Wall gardens may lack the dimensions of a traditional greenhouse, making them unsuitable for people who want to walk around inside or carry out large scale growing programmes, but they do bring advantages of their own. Foremost among these is that they can look very stylish, becoming a feature that enhances the outside of the house. 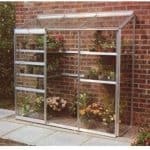 They also often represent very good value for money considering their size and durability, which is why they can be an ideal cheap greenhouse for the amateur or small scale gardener. 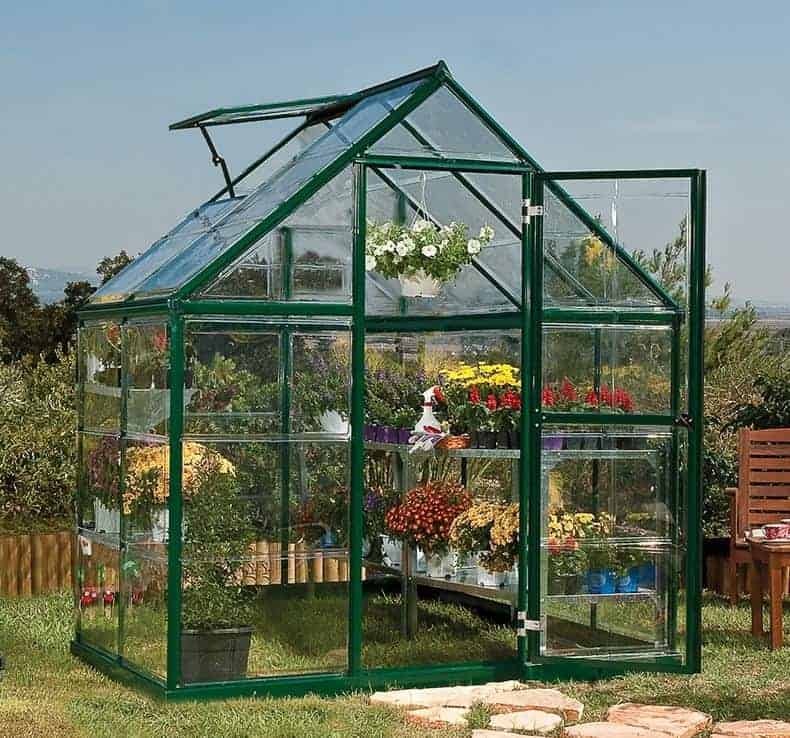 This compact and cheap greenhouse from Halls is a perfect example of the genre, deservedly gaining a place within our top fifteen list. It has a silver coloured aluminium frame, but what we liked most about it was the relatively large sliding door which gives easy access to the interior. This means that even though the base dimensions are a modest 1.92 x 0.67m, with a maximum height at the top of its pent roof of 1.83m, you can reach into every corner and therefore make the most of all the space that is available. We were also impressed by the use of horticultural glass as standard, which can bring benefits especially to plants that need a large amount of light to thrive such as begonias. 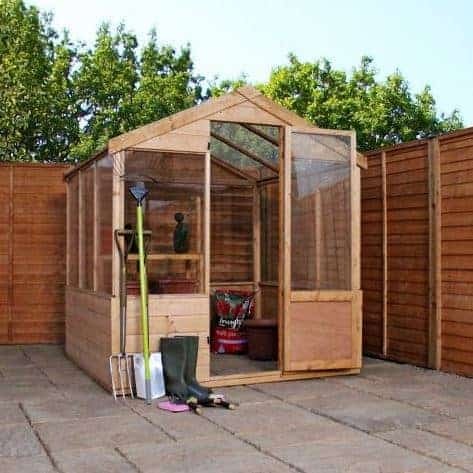 This wooden cheap greenhouse has a compact footprint that makes it eminently suitable for gardens where lawn space is in short supply, with a base width of 1.16m and a base depth of 0.63. That’s where its similarity to other small timber greenhouses in our league table ends however, as this Mercia greenhouse has a unique look. It’s much taller than we usually see with a greenhouse whose base is approximately four foot by two foot, with a peak height of 2.01m. 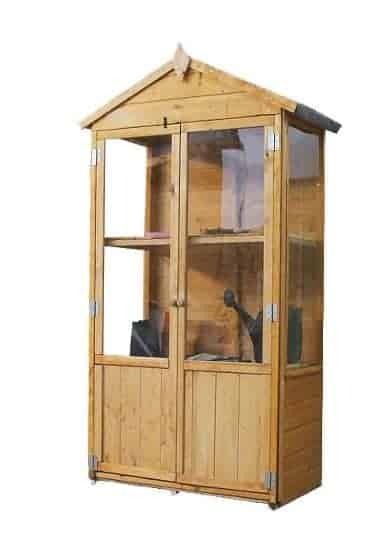 This gives it an almost sentry box appearance, and it’s one that we found very attractive, and which could become an exciting feature within a garden. 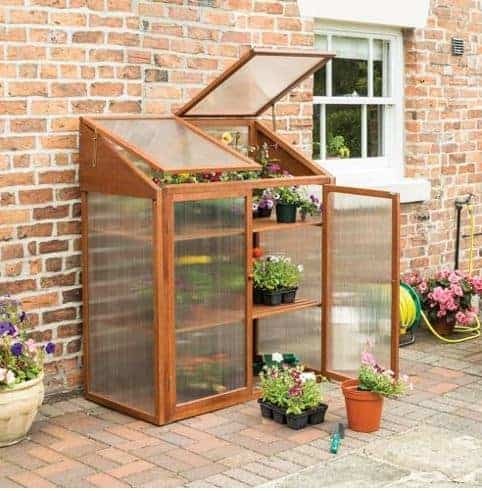 Another thing that we liked about this cheap greenhouse is that it has two integral shelves which essentially divides it into three compartments. The bottom third is covered by the smooth shiplap cladding, so this is ideal for use as a garden store for items such as soil and compost. We were also pleased to find that the greenhouse included integrated floor bearers, lifting the OSB floor above ground level and therefore protecting it from surface moisture that cold otherwise lead to rot developing. This is one reason why the manufacturer has been able to supply a 10 year guarantee, although this is dependent upon the customer adding further coats of wood preserver on an annual basis. This is the second silver framed wall garden from Halls to feature in our list of the very best cheap greenhouses that can be purchased online in the UK right now. This, however, is the four foot by two foot model, and its more restricted growing capacity explains its lower position. 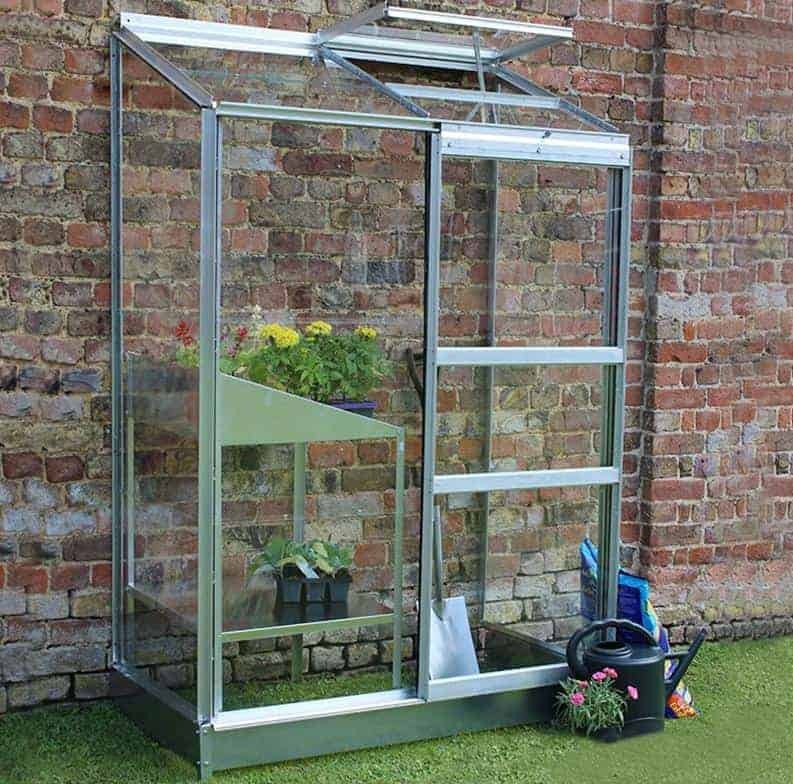 With a price tag of less than two hundred pounds however, we can easily imagine this being used as a supplementary greenhouse for a gardener who is expanding their growing programme, or alternatively as a first cheap greenhouse for somebody who is just embarking on a fascinating new hobby. We were pleased to find that despite its smaller size and reduced asking price it shares the qualities of its six foot by two foot entry. Once again then we have the smooth sliding door that provides easy access, and the opening lids to provide quick and effective ventilation. We were particularly pleased to see horticultural glass being used on such a very cheap greenhouse as well. On the downside the warranty only lasts for one year, but with high quality components used this doesn’t worry us overly, as we think this is tough enough to stand up to the British weather for much longer than that suggests, particularly with the added protection from a supporting wall. This is neither the largest cheap greenhouse we’ve seen nor the most elegant, which accounts for its position in the penultimate spot within our league table. It does, however, have benefits that make it stand out from many other small greenhouses that we’ve seen and it’s therefore deserving of its spot. 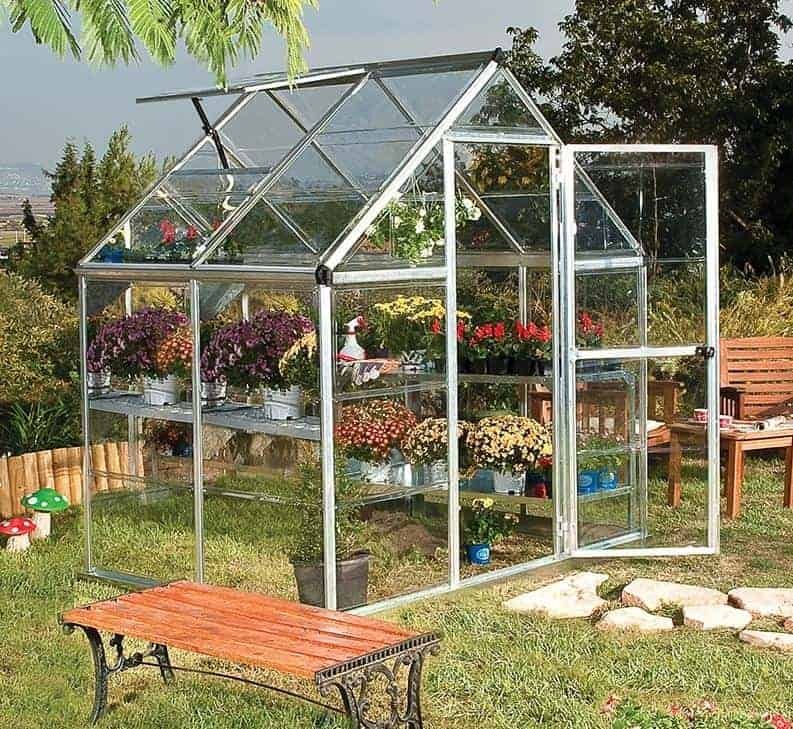 One of these is the price of much less than two hundred pounds, which makes the benefits of a small yet reliable and effective greenhouse available to those working on a tight budget. We were also impressed by the inclusion of three shelves; this is more than we’ve found on other greenhouses with similar dimensions that we’ve reviewed, and it’s a time and money saving addition. Polycarbonate glazing is used, as we often find in cheap greenhouses, but at 3mm it was a little thicker and sturdier than we often see. It has also been given a protective coating against UV light. This protects sensitive plants from being damaged by the sun, and yet it still achieves a good light transmission rate. 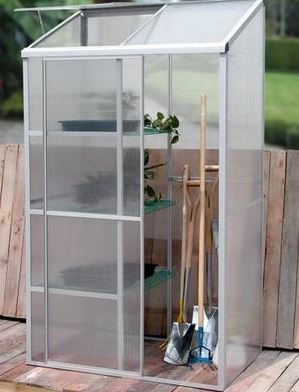 It also means that the glazing has a slightly misted effect, but we feel that this in itself can be a useful boost to security if you also plan to use this greenhouse as a compact garden store for tools and equipment. As we’ve already seen, a wall garden can be a cost effective growing solution for those who only need a small scale cheap greenhouse or who don’t want to use up their precious lawn space. This four foot by two foot wall garden brings another benefit as well, in that we found it very pleasing on the eye thanks to the dark green colour scheme that has been expertly applied to the aluminium frame. We were pleased to see that it has been applied by a powder coating process as well, as this makes it very resistant to both knocks and weathering. 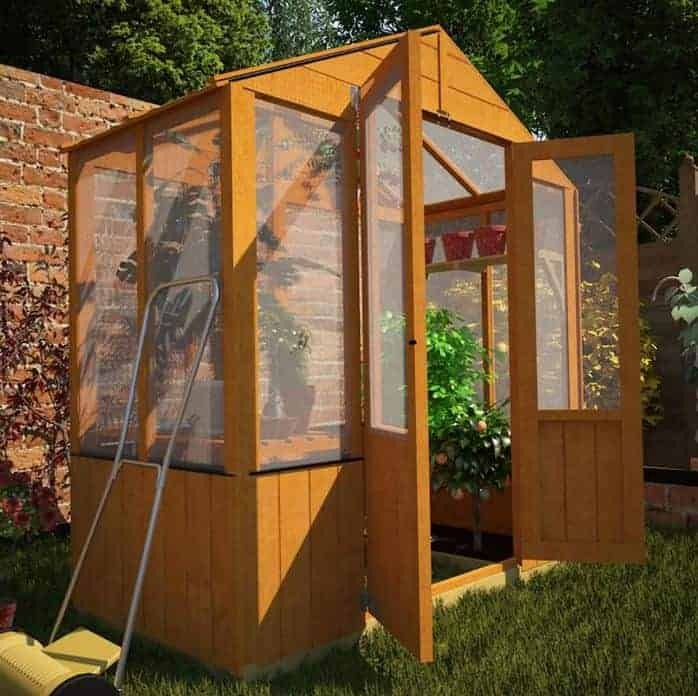 We feel that this cheap greenhouse should blend in particularly well if it’s fixed to a wall that has lots of shrubbery around it, or maybe that has ivy climbing up it. It’s also a very practical, if compact garden building, thanks to the sliding door that gives easy access to the interior, and the pent roof that can be lifted up and then locked into position when ventilation is needed. With horticultural glass used as well, which is always something we welcome on a cheap greenhouse, it’s only the relatively high asking price and the lack of a long warranty period that sees this take the last position, rather than a higher one.